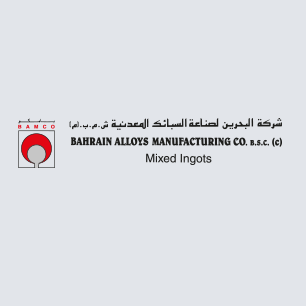 BAMCO is a manufacturer of a wide-range of primary aluminium alloys and master alloys in Bahrain. One of the major shareholders of BAMCO is Hightech Metals Investment GmbH of Germany, a leading manufacturer of non-ferrous metals and a world leader in metallic powders. Located in the main industrial area of Bahrain, BAMCO is strategically situated both locally and internationally with a well-connected road system to the major ports. Regular shipping schedules to all parts of the world, covered by all major shipping lines, ensures timely and cost effective deliveries, no matter where the customers base. BAMCO’s product range covers all types of primary-based foundry and master alloys used in a wide range of castings. Products mix consists of wheel alloys (A356.2) unmodified, Sr-modified and Concentrated Master Alloys of Si, Cu, Mg, etc. BAMCO also produces special alloys to the requirement of the customers. Products are mainly used in automotive industries. BAMCO has received recognition as a quality supplier of foundry ingots and master alloys. All products are manufactured to international standards. The company operates a quality management and production system and has been accredited ISO 9001 – 2000 registration under the British Standards Institution, UKK. In addition, BAMCO has the added advantages of the wealth of technical expertise and facilities of the Hightech Metals Investment GmbH of Germany at its disposal.